Before anyone gets carried away, this is not Genesis the band’s own themed casino, although i’m still holding out for that! 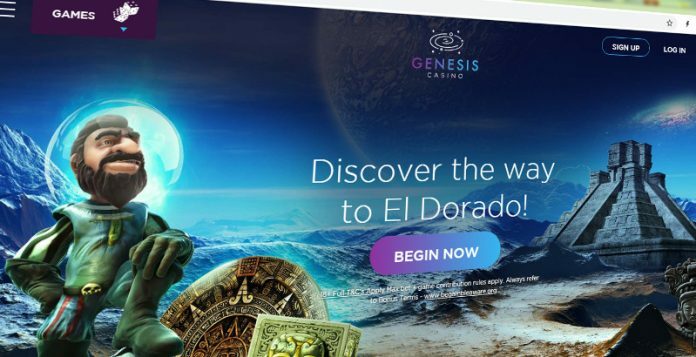 Instead Genesis Casino takes you back to the dawn of creation with some awe-inspiring images and attempts re-create the generic casino theme that we’re used to seeing. Genesis Casino has re-written the rule book on how to create a simple yet power user interface for a modern casino site. 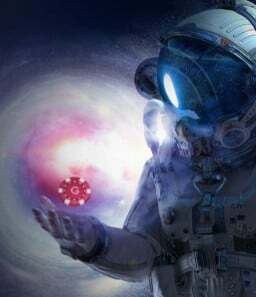 So lets take a peek into the cosmos to see what’s in store. Unlike most casino’s you come across that are part of a bigger holdings company, Genesis Casino is completely independent, which is why some of their welcome and bonus offers are not as “earth shatteringly” great. With that said you can’t complain about Genesis Casino’s first deposit bonus of 100% up to £100 plus 300 bonus spins on top, it’s certainly enough for any die-hard casino player a few hours of table-time. If you’re a regular casino punter you will really appreciate Genesis Casino’s Weekly Bonus. Simply deposit £50 or more throughout the week (Monday – Thursday) and receive a 25% bonus up to £100 on Friday. Lightspeed Monday will give you a great start to the week. Deposit and wager £10 or more between Thursday to Sunday and receive free spins into your inbox The more you deposit the lager the number of free spins you get, it’s a win – win. Genesis Casino also has a competition that runs until 31st December 2018 where the winner will get an incredible 7 night Mediterranean cruise. Check out their terms for more details. Having read through Genesis Casino’s terms and conditions, there’s nothing in their that surprises us. The 40x wager requirements is a little on the high side but at least it’s only on the bonus amount and not the deposit. Minimum deposit of £10 and a maximum bet of £5 using your bonus is now the norm. But be aware that the bonus is only valid for 14 days, after that it’s gone. The same applies to the free spins which are only available for 72 hours, so we recommend you use them immediately after you deposit. For reasons that only god himself knows, players will receive their free spins in a daily allowance of 30 spins per day for 10 days after the deposit has been met. It’s goes without saying but make sure you read Genesis Casino’s full terms and conditions, so you have a clearer understanding before placing a bet. Given how new this casino site is Genesis has a wide variety of games for you to enjoy. Just look at that beautiful games selection menu bar… coorrr! Get stuck into comical mayhem with Reactoonz, glacial adventures with Troll Hunters and set sail for Nordic chaos in Vikings go Berzerk. What really impressed me was the selection of table games on offer, with a couple of gems you rarely see anywhere else. Spanish 21 Blackjack and Multihand Vegas Downtown were two personal favourites that I strongly recommend. Initial loading times were very quick for Genesis Casino, due to it’s cunning ability to hide most of the slot game icons (which we’ll come back to later on). We used 888 Casino as the benchmark as it’s recently had a complete overhaul of it’s site to make it more responsive for mobile users. As you can see from the chart loading times were near identical even though Genesis Casino had over three times the data to download (7MB compare to 2.5MB for 888 casino). 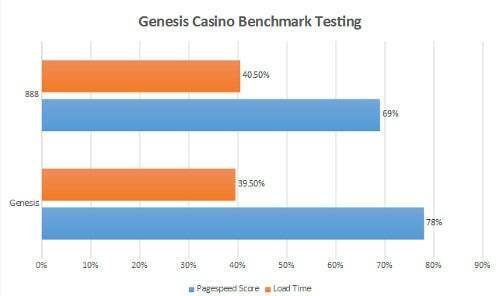 Pagespeed score was equally impressive with 888 marginally quicker by 10% over Genesis, even though Genesis have much more slot game images on the home screen compared to 888. Overall It performed very well. 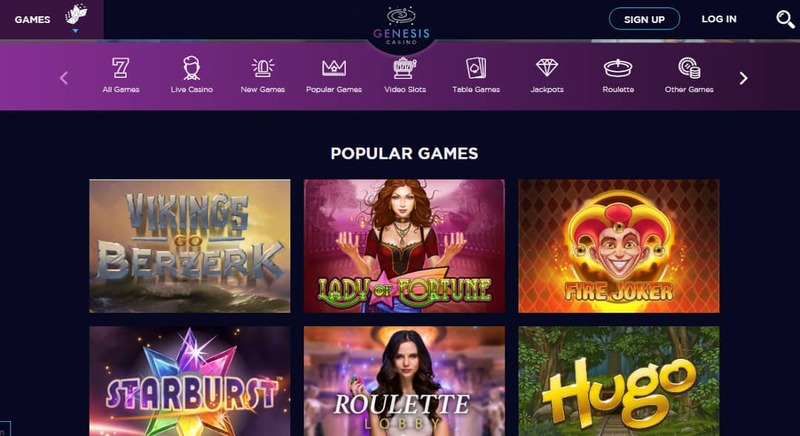 What makes Genesis Casino stand out from the multitude of online casino’s out there had to be it’s design and layout, which may not be that ground-breaking but certainly does deserve a round of applause as we’ll explain. Careful consideration has gone into the layout, from game drop-down menu’s that list all categories available, to subtle show more buttons underneath each group of slot games which optimises load-time for users. Even something as simple as the help (question mark) icon at the far top-right provides all of the contact information for the support you need. It’s this level of attention to detail that makes this casino site a real star. The main menu slides across from the left and contains sufficient sub categories to get you to the right place. In all this is a clever well thought out site. If that wasn’t enough Genesis Casino have a stellar collection of payment options to choose from. 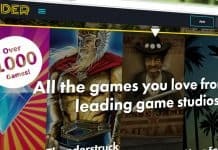 Some of them you’ll be familiar with such as Mastercard and VISA, but they also provide the latest mobile payments such as BOKU and zimpler which allows Genesis Casino players to pay using their phone bill. For more details on BOKU you can check out our comprehensive guide to casino pay by phone bill, where we explain why this payment process is soon to over take all other methods due to it’s enhanced security features and simplicity. 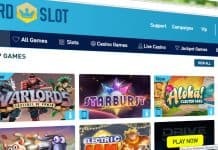 I have to say it was refreshing to find a new and independent white-label put so much time and consideration into a casino site instead of rushing it through before releasing to the public and the rewards are there to see. 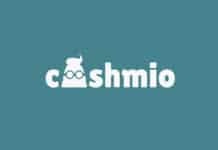 The site is slicker than a car salesman with a deluge of gorgeous HD images and polished layout, it really enhances the senses of the user without sacrificing on page speed which is equally impressive. Welcome bonus and regular player bonuses are pretty decent but I’d like to see the wager multiplier drop down to something more reasonable. But this really is the only blemish we could find in what has to be the best casino newcomer of the year.